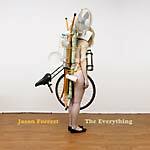 "Jason Forrest turned heads with his first Sonig release, The Unrelenting Songs of the 1979 Post Disco Crash, a musical rollercoaster ripping through genres like an amphetamine-crazed hobo. It received rave reviews from a respected array of international press -- a remarkable accomplishment for such an odd and ambitious mix of high-speed disco and breakcore with a '70s swagger. The question, of course, was 'can Forrest possibly repeat this success?' A few beats into Shamelessly Exciting and there is suddenly no doubt -- yes, he can and he does it in style! Cascades of sound taken from virtually every form of rock music (hard/soft/punk prog/blues) pour down heavier than ever before. Even more intense is the sound of shattering samples, every single one of them vying for the listener's attention. Forrest sets off fireworks of ideas and references, exuding enormous energy along the way, filling every possible nook with a rocking good time."